(A. Lopes, S. Goze, E. Nezry: "Polarimetric Speckle Filters for SAR Data", Proceedings of IGARSS'92, Vol.1, pp.80-82, May 1992). (E. Nezry, A. Lopes, R. Touzi: "Detection of structural and textural features for SAR images filtering", Proceedings of IGARSS'91, Vol.4, pp.2169-2172, June 1991). The upper image is a 4-looks JPL-AIRSAR high resolution airborne polarimetric SAR image (Jet Propulsion Laboratory, Pasadena, CA, USA), P-band, polarizations HH (green), HV (red) and VV (blue). The imaged scene is the Landes pine forest in southwest France. 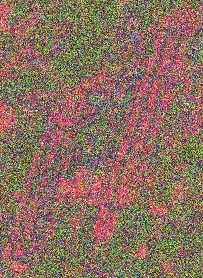 The bottom image is the filtered one. Speckle is efficiently removed on all three HH, HV, and VV channels, without loss in useful spatial resolution of the radar sensor. The textural properties of the imaged scene are well restored on all three polarimetric channels, as it is visible within the forest stands which are much better identified on the filtered image. (E. Nezry and F. Yakam Simen, 1999: "New distribution-entropy Maximum A Posteriori speckle filters for detected, complex, and polarimetric SAR data", Proceedings of IGARSS'99, Vol.3, July 1999). (E. Nezry and F. Yakam Simen, 1999: "On the preservation of polarimetric signatures and polarimetric texture signatures by fully polarimetric MAP filters", Proceedings of IGARSS'99, Vol.3, July 1999). 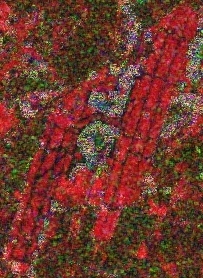 HH, VV and HH polarizations are represented in red, green, and blue. HH-VV, HH-HV and VV-HV degrees of coherence are represented in red, green, and blue. It is noteworthy that, since these filters are fully polarimetric, all useful polarimetric features, such as phase differences and degrees of coherence between polarization configurations, are also restored with the same efficiency as it is the case of the radiometry. 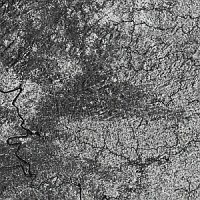 This speckle filtering process is particularly adapted to the treatment of spaceborne polarimetric SAR images. 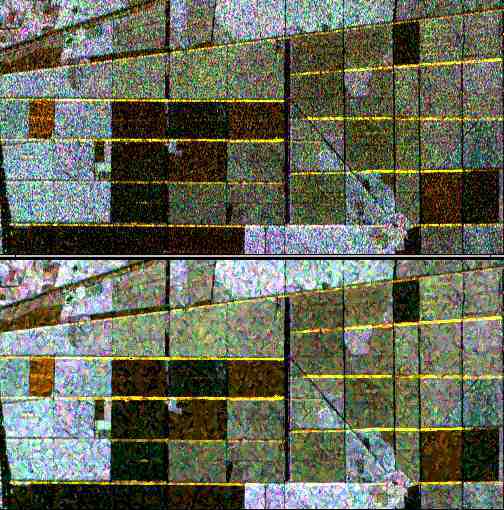 The black areas in the above polarimetric images correspond to recent clearcuts. (E. Nezry, A. Lopes, D. Ducrot-Gambart: "Supervised radiometric and textural segmentation of SAR images", Proceedings of IGARSS'93, Vol.3, pp.1426-1428, Aug. 1993). (G. Kattenborn, E. Nezry: "Analysis of an ERS SAR time series and optical satellite data for forestry applications in temperate zones", Intnl. 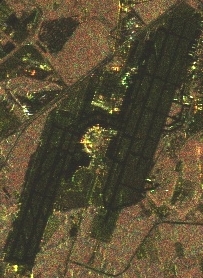 Archives of Photogrammetry and Remote Sensing, Vol.31, Part B7, pp.331-339, July 1996). - (E. Nezry and L. Demargne, 1998: "Using SPOT and radar data to inventory forests in Sarawak, Malaysia", Spot Magazine, n�29, pp.28-31, July 1998). - (E. Nezry, F. Yakam Simen and I. Supit: "Estimation of forest biomass or timber volume using JERS-1 and/or ERS SAR's: A comparative application to the Honduran rainforest", Proceedings of IGARSS'2000, Vol.1, July 2000). (E. Nezry, J. Schotanus Sakiman, Soethomo and F. Yakam Simen: "Assessment of JERS-1 data to implement a fire prevention project in Indonesia", pilot project J-2RI-008, report to NASDA, May 2002). 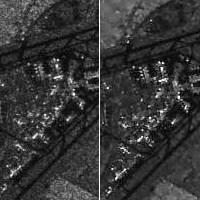 A Speckle Filtering Module for Radar (SAR) images, including all the newest adaptive speckle filtering algorithms developed by PRIVATEERS NV is available since 2004 within SARscape, a most professional image processing software package. SARscape is fully compatible with the geomatics and GIS (Geographic Information System) software ®IDL-ENVI (Research Systems Inc.) and ®ArcView (ESRI Inc.). SARscape supports Windows 98/NT/2000/XP and Linux 2.6 operating systems. Series of SLC SAR scenes (interferometric series, for example). SARscape is produced and commercialized by the Swiss company SARMAP SA. SARscape is a Registered Mark of SARMAP SA.